This guide has been written for all vintage radio enthusiasts, whether those who have just become interested in the subject and have no previous technical knowledge, or those with a good general grounding in this respect but who wish to learn more about the practical aspects. Part 1 is devoted to the essential basic theory and Part 2 to practical repair work, whilst Part 3 consists of a wide- ranging and valuable collection of tubes (valves) and other data relating to vintage receivers. Readers who already know the basics may, if they wish, turn straight to Part 2, but even for them a little revision may be useful and interesting. 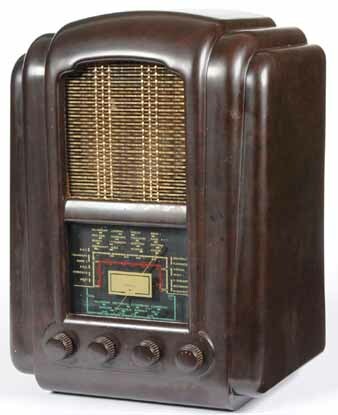 above: A Ferranti Model 145 'Jelly Mould' Brown Bakelite Valve Radio, circa 1945, with gilt metal front grille and four bakelite dials, back cover, 47cm by 33cm. When I was learning about tubes (valves) radio in the days when it was contemporary and not ‘vintage’, I got hold of as many books as I could on the subject, of which there were many in those days, some good, some indifferent and some plain bad. Re-reading them now I can see that some were produced cheaply and quickly to exploit what was then a growing interest, some were written by highly technical people with poor communicative skills and just a few were crafted together by practical radio engineers who knew how to ‘get things across’. Obviously, to be able to become reason ably proficient in any subject one needs first to know its basic principles, but far too many books seemed to throw readers in at the deep end and thus ‘blind them with science’ before they had learned even to paddle, as it were. For myself, a poor mathematician, nothing could have been more daunting than to be faced with pages full of formulae, to understand which the reader would have had to be just as knowledgeable as the author, if not more so. The problem as I saw it was that these writers were envisaging their readers as ending up with degrees in radio engineering, not as simply trying to learn sufficient to enable them to get started in the subject. For this reason I have here restricted the amount of technical matter to the bare minimum necessary for the reader to be able to grasp the whys and wherefores of the practical work. For those who wish to go more deeply into theory, a suggested bibliography is printed at the end of the guide. To understand and appreciate vintage radio properly one has to project oneself back into the past. For this reason, throughout this guide I have retained the use of technical terms that were current in the vintage years of radio, e.g. capacitor and not capacitor, cycles per second (Hz) instead of hertz. There is a sound reason for this, not just nostalgia. Anyone engaged on repairing vintage radio sets is going to have to refer to contemporary data published many years ago when the old terms were current, and having mentally to translate them into modern equivalents would only add to the difficulty of understanding circuits and servicing instructions. Likewise, all dimensions, etc., quoted appear in Imperial/American measurements just as they were originally. For instance, resistive mains leads were always specified as having a resistance of either 60-ohm per foot or 100 ohm per foot; to attempt to metricate something like this would not only be superfluous, it would be perverse. Some years ago, in a magazine article, I adapted a famous phrase thus: ‘the tubes (valves) are going out all over Europe, and we shall not see them lit again in our time’. It was a decidedly rueful attempt at humor, and no one is happier than I that the prediction has been proven false, for there has been a great resurgence of interest in old tube (valve) radios. No doubt some of this stems from the well-known British love of restoring all sorts of old equipment, but where the tube (valve) radio scores heavily is that however old it may be it need not be just a museum piece to be brought out on high days and holidays. Once restored it can be placed in everyday service and it will perform reliably and economically. Every now and again one of those confident know-alls who crops up in all walks of life will say to me, ‘of course, you can’t get the tubes (valves) nowadays’, and I must confess that I take great pleasure in deflating them by informing them that not only are there millions of tubes (valves) held in stock by dealers, it is actually easier to obtain some rare types than it was just after the Second World War, when they were being kept ‘under the counter’ by radio dealers! Thanks to a growing awareness of vintage radio the contents of old shops and of private collectors are frequently offered at auctions, especially those organized by The Radiophile. As well as tubes (valves) , components and complete receivers may be obtained from this source, or from specialist dealers, whose expertise and integrity are well proven. The names of some of them will be found in the advertisement supplement at the end of this guide. The emphasis of the guide is on the practical side of repair work, extended to include mechanical as well as electrical aspects of servicing. Wherever possible original diagrams have been used to illustrate the various features, common or rare, mentioned in the text. As before, there is a large reference section, covering a wide range of information culled from many contemporary sources and I wish to express my gratitude to those persons and organizations who kindly lent material, and to the copyright holders for permission to reproduce. A2. Tube (valve)characteristics and base connections. A3. How old is that radio set?